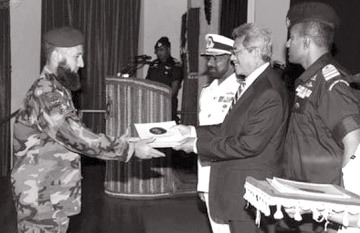 The graduation ceremony of the asymmetric warfare course conducted by the Special Boat Squadron (SBS) of the Sri Lanka Navy was held on Thursday at the Admiral Wasantha Karannagoda Auditorium in Trincomalee. Defence and Urban Development Secretary Gotabhaya Rajapaksa was the Chief Guest. Navy Commander Vice Admiral Jayanath Colombage, senior Naval officers including Commander Eastern Naval Area, Rear Admiral Rohan Amarasinghe, Bangladesh Defence Adviser, Commodore N. Nasir, Maldives Defence Adviser, Lieutenant Colonel Mohammed Mukthar and Commanding Officer SBS, Captain Priyantha Perera were also present. The Navy Commander said it was a privilege to have the Defence Secretary, the architect of the victory of the three-decade war, as the Chief Guest at the completion of the first ever endeavour undertaken by the Sri Lanka Navy in disseminating its battle experiences. Defence Secretary Rajapaksa said the Sri Lanka Navy asymmetric warfare course, capitalises on the experiences gained by the Sri Lanka Navy during the three decades of combat against the LTTE. The codification of such experience into a naval doctrine is an important step in ensuring the preparedness to face the asymmetric maritime threats, he said. The Defence Secretary said he was pleased to note that several officers and personnel from Bangladesh, China, the Maldives and Pakistan had successfully completed the training programme alongside with their colleagues from the Sri Lanka Navy. Sixteen participants from Bangladesh, China, Maldives and Pakistan followed the three-month course along with six Sri Lanka Navy personnel. Bangladesh, the Maldives and Pakistan had sent a four-member contingent each, comprising an officer and three sailors, while China had sent four officers. One SBS officer along with four sailors and another officer from the Naval Patrolman Branch joined them in the highly specialized training where the Sri Lanka Navy shared its own experience in successfully defeating terrorism. The SBS is the Navy's elite special marine force specialised in amphibious warfare and maritime counter-terrorism operations. Established in 1993, it conducts a wide range of special water-borne and land-based operations. They played a pivotal role in defeating LTTE terrorism inflicting heavy damages and casualties to the enemy in a series of well-coordinated special operations.